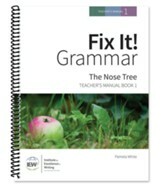 We are absolutely loving this entire grammar program, and the Teacher Guide is outstanding! Lots of helpful hints for teaching, and helping your students succeed while having fun learning. Highly recommend!